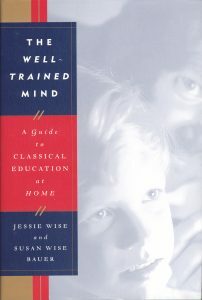 The first edition of The Well-Trained Mind: A Classical Education at Home (1999) outlined the three stages of classical education (elementary, or “grammar”; middle, or “logic”; and high school, “rhetoric”), explained how to teach each stage, and recommended specific books and curricula for every subject in every grade. 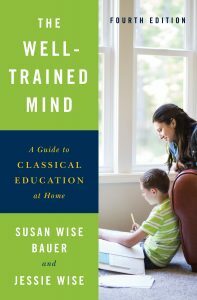 Many of these resources, chosen because they were academically excellent and compatible with classical methods, were not designed specifically for home educators. They were good—but some were also expensive, or hard to find, or not simple for parent use. In some cases (for example, elementary Latin), only one program was available, period. 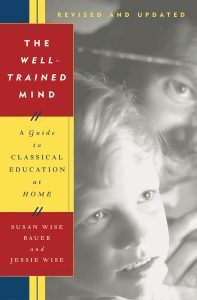 By the time the second edition came out, in 2004, the popularity of The Well-Trained Mind had led to the development of new classically-oriented curricula, designed specifically for home use. The second edition included many of these, in place of previous parent-unfriendly recommendations. Many resources from the first edition had become unavailable (particularly in the elementary grades, books and programs go out of print ridiculously fast), and these were replaced with new recommendations. The third edition, published in 2009, carried on with the expansion of resources designed specifically for home educators, and also continue to replace out-of-print resources. The college application chapters were also significantly rewritten, thanks to the new SAT and the rising popularity of the Common App among college admissions offices. The fourth edition, which came out in 2016, also replaced out-of-print books with new recommendations, but it also incorporated four additional changes. First, resources from the previous editions that had proved quickly outdated (publishers and sources, home school laws, state support groups, etc.) were moved online, where they could be easily kept current. Second, the math and science recommendations were completely revamped. Math and science resources for home educators have lagged behind history and language arts curricula; the fourth edition reflects the much-improved options now available. Third, the fourth edition points to a dynamic online resource lists of tutorials, live classes, and other web-based resources, many recently developed. Finally, the fourth edition divides each chapter clearly into “how to teach” and “suggested resources” sections. 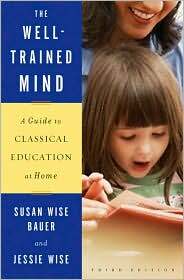 In previous editions, the instructions on how to teach by classical methods were often combined with descriptions of how to use our recommended resources. Since many parents had expressed the desire to follow the book’s methods while choosing their own resources, we decided the separate the “how to” instructions from the “what to use” recommendations. For a video description of the differences between the third and fourth editions, see https://welltrainedmind.com/the-well-trained-mind-extended-guide/.